Logan and Grace Wisnewski are poised to achieve a unique double on match day one of the OFC Youth Futsal Tournament in Auckland tomorrow. While the Oceania region has had its fair share of famous family connections within or across different national teams, the Wisnewski siblings are set to debut for different age-group national teams on the same day. Their respective New Zealand U-18 futsal sides each open their quest to qualify for the Buenos Aires 2018 Youth Olympic Games against their Tongan counterparts and somewhat fittingly, Logan – who turns 17 next month – will be first to pull on the shirt. The elder of the pair, Logan was the first to take to the court over a decade ago. “I stared playing when I was five at a holiday programme. I saw a newsletter for it and decided to go along and started to love it from there,” he said. “I picked it up after Logan as he’s a few years older than me,” said 15-year-old Grace. Both have mixed futsal and football in almost equal measure as part of their round ball diet but neither could be pressed to single out a preferred option. “Both are pretty similar but have their differences. I enjoy them both equally and I can’t pick one as my favourite,” said Grace. “I like playing them both and enjoy the differences between them,” echoed Logan. Despite the OFC Youth Futsal Tournament being the first of its kind in the region, the age-group event won’t be entirely new territory for Grace. 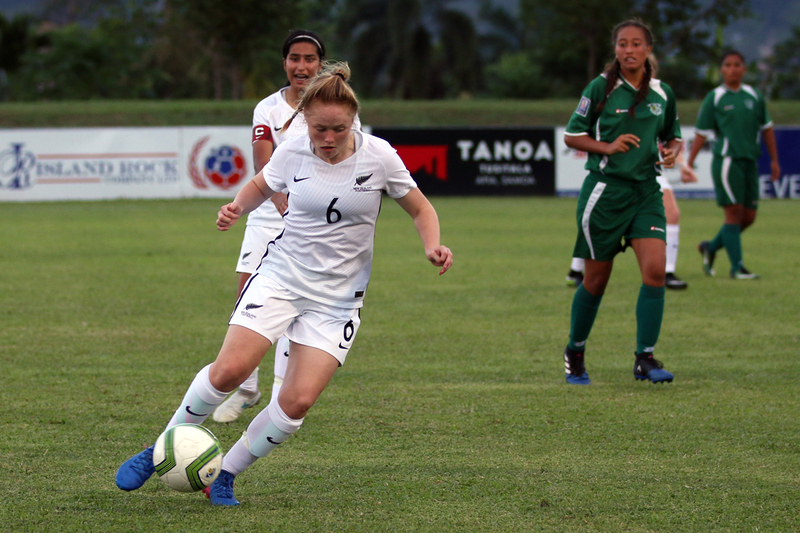 She represented New Zealand in the 11-a-side format as part of their successful OFC U-16 Women’s Championship campaign in Samoa two months ago, netting six goals in five games including a hat trick against Tahiti. As one of three players backing up from that event, Grace’s experience will likely be drawn upon during the event as the team head into the unknown with New Zealand’s first foray into age-group international futsal. Logan, too, will have a leadership role although his is more formal having been named captain of the U-18 men’s squad. Logan steps into the national set up after a breakout season with WaiBOP Futsal in New Zealand’s Futsal National League last year. He finished as the side’s second top scorer with 11 goals, helping to fire WaiBOP into the final. “The national league experience was good because it was a completely new thing for me. It was awesome to play alongside mates from WaiBOP,” he said. Like most siblings, the Wisnewskis are both competitive and supportive, traits which should come to the fore during the week. “We give each other constructive criticism. We’re very competitive at home which creates a good atmosphere,” said Logan. “We share a bit of banter and we can each take a joke. There may yet be a twist to that relationship this week, brought about by a quirk of the qualification rules. The winners of the men’s and women’s tournaments – except for New Caledonia who are not an Olympic nation – will qualify for the Buenos Aires 2018 Youth Olympic Games. However, the two qualifying teams cannot be from the same member association so where a country has entered both the men’s and women’s events, the member association must nominate their preferred qualification team. Should it come down to that for the New Zealand teams, Grace admits there would be mixed emotions. “It’s definitely competitive between us. We want each other to do well and to go for it. Each of us would love for the other to go but only one of us can [if we both win]. New Zealand U-18 men begin their campaign against Tonga U-18 at 10am at Bruce Pulman Arena in Auckland while New Zealand U-18 women begin at 11:30am also against Tonga.